Hi ufcnancy team – I have right around $50,000 to spend on a new dual-cab ute for work, and I’m torn between choosing a Ford Ranger XLT ($51,490) and an Isuzu D-Max LS-U ($50,800). I cover about 40,000km a year with about 10,000km of that on dirt, and I carry some bulky tools. On the weekends, I tow a go-kart trailer and on the odd occasion a horse float. We have two young kids in the family, but they won’t spend a lot of time in my car. I’ve always like the Isuzu, but why would I want to choose that over one of the best sellers in the market? What am I missing? Interesting! Sounds like you’ve done your homework! The Isuzu D-Max is a bit of a favourite amongst the ufcnancy crew because it’s a well thought-out, honest and reliable rig that has decent off-road chops right out of the box. A heavy-duty bash plate under the car, along with an air filter that’s mounted in the mudguard to help minimise dust ingress, means that the D-Max is ready right away for the dirt mileage you do. On road, the 3.0-litre diesel is probably the most underpowered in the category at 130kW and 420Nm, but when combined with the six-speed auto, it hides its shortcomings well. It’s an older-gen engine that can get noisy when pushed, but its commercial origins mean it’ll outlast the apocalypse. It has heavy-ish steering without a lot of feel, while the rear end – as with all unladen utes – can be a touch on the jiggly side. If you’re adding tools to the tray, though, that should settle it nicely. Interior-wise, there are plenty of clever touches like extra bottle holders and the like, but the lack of reach adjust on the steering wheel is an annoyance. Don’t forget that it also misses out on things like Apple CarPlay and AEB, thanks to its advancing years. The Ford Ranger, on the other hand, is definitely more car-like inside, and its Sync 3 multimedia system is terrific. The seats, the relationship to the steering wheel… all very good for the longer journey. It also gains important safety tech like AEB. The 3.2-litre five-cylinder engine also pairs with a six-speed auto, and while it feels a bit more torquey and fulsome than the new 2.0-litre four-cylinder/10-speed combo, the 147kW/470Nm five-potter is less powerful and less torquey than the twin-turbo four. Still, it works perfectly well, and is a little more refined than the Isuzu engine. 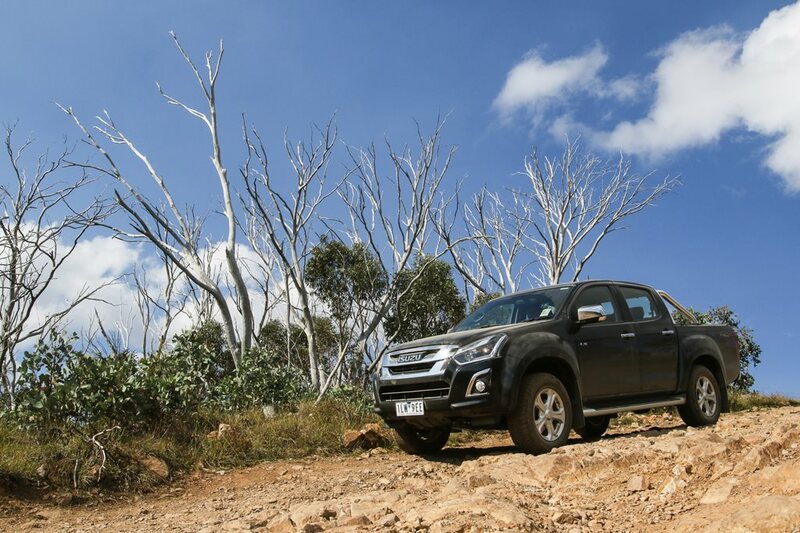 It’s not as rough and tough as the D-Max, though, and you may need to service the air filter more regularly if you tackle dusty terrain. In short, there is not a whole lot of difference between the two, so it comes down to which one you fit in best. Taller drivers of the D-Max, for example, can find the reach to the steering wheel to be a bit too long, and its rear seats aren’t as comfy as the Ranger’s. When it comes to towing, both offer up to 3500kg of braked towing capacity, but the Ranger's rear-view camera is better than that of the Isuzu's when it comes to hitching. If you pushed us to make a call, we’d take the fact that you do a lot of dirt into account and push you towards the D-Max.